← To Eligibility Post or Not to Eligibility Post? This is a children’s steampunk retelling of Sleeping Beauty; I originally wrote it for the Fairypunk project, but I wanted to get it out here and figured there’s plenty of other fairy tales I can tackle when it’s time. If a clock has ticked, it must tock, and thus time moves along. And in every tick and tock, there’s a story, and sometimes more than one. Once upon a tick and tock, there was a great Lord and a greater Lady, who were Patrons of the Arts and Sciences. They endowed libraries and laboratories, and commissioned portraits and poems and marvelous machines that could play chess or spin a silk thread so fine you could barely see it or that could even build their own, tinier machines to make tinier machines in turn, and so on and so on, until they produced the head of a pin inhabited by seven clockwork angels, all dancing. The Lord and Lady loved the works they commissioned, but they yearned to produce something of their own. And one day it came to pass that the Lady announced to her Lord that they had collaborated very well indeed, and that she would soon produce an heir. Their daughter was fine and fair. They named her Aurora, after the Aurora Borealis, and to celebrate her christening, they invited all the scientists and artists and musicians and philosophers and inventors they had helped. The day of the christening, Aurora was given amazing gifts: a pair of spectacles that could see everything from the smallest cell to the farthest star; a flowering garden whose trees produced avocado pears and pineapples, cherries and peaches, all from the same branch; a clock that could tell her the time on the moon and predict the next three days’ weather with reasonable accuracy; a talking parasol that recited cheerful limericks in the morning to amuse her and long, languorous epics in the evening to lull her to sleep; and sundry other delightful devices and contraptions, each more cunning than the last. But the Lord and Lady had neglected to invite one guest, a scientist named Artemus Scuttlepinch (who might have been omitted on purpose, for he was very bad at dinner conversation) and he stepped forward at the end. “I have a gift as well!” he announced. “Behold the Cabinet of Dreadful Fates!” He whisked his dinner cape aside with a flourish, revealing a squat box painted a malignant black. Brass dials and switches covered its face. Before anyone could stop him, he said, “This is for Aurora!” He pressed a switch. He signaled for the guards, who took the cackling Scuttlepinch by the arms. Another seized the machine and raising it overhead, dashed it on the ground, where it shattered, revealing a series of gleaming tubes and poisonous green lubricant, which roiled like drops of mercury on the floor. Scuttlepinch only laughed the harder; the sound sent shivers down the spines of the witnesses. But another scientist, Miss Mariah Fleetthought, spotting Scuttlepinch, had lingered in the back of the crowd, fearing just such an occurrence. She now stepped forward, clearing her throat with a diffident manner. She set the box she held on the floor, and it unfolded into a clockwork kitten, which picked its way through the shards and droplets to leap nimbly into Aurora’s crib and curl there, its green eyes glittering watchfully despite its position of repose. After that, the Lord and Lady took comfort in the raising of their daughter and avoided thinking of her possible fate, although they were instrumental in passing a bill that banned spindles outright. She was a bright and sunny child, and their delight in her outweighed all other considerations, until the marvelous machines produced under their patronage were bundled into a cellar to sit unused and dusty. Aurora was talented and well-tutored, and had all the social graces as well. Her only flaw, which no scientist counted an actual weakness, was a driving curiosity and a craving to know how things worked, which led to her taking many things apart before she learned how to put them back together. In all of this, she was companioned by the clockwork cat, which haunted her footsteps and watched with wise green eyes as she dismantled things. They came to call it Gizmo, and sometimes forgot that it was not a living creature, for it seemed as cat-like as any cat, despite its devotion to the child. On her eighteenth birthday, they held a party for Aurora, and invited many young people of her age. But she found them boring, preferring to talk to the scientists about her own discoveries and eventually, bored, she slipped away, trailed by Gizmo. She made her way down to the cellar, where she was in the process of taking apart a particularly marvelous lace-making machine, because she was curious about the patterns it produced. Gizmo did not approve of this particular machine, which was curious, and today, as she continued to explore its inner workings, the cat grew increasingly agitated, swatting at her with a paw and meowing in its tinny voice, till she pushed it aside more roughly than she meant to. As she did so, her balance slipped a little and her hand pushed farther into the machine, where it met a certain inner part that spun thread, something that any seamstress might have called a spindle. She withdrew her hand with a cry of pain, looking at the drop of blood on it. Dizziness overcame her and she sat back on her heels. Darkness pressed in on her vision, but she could hear Gizmo nearby, its head pushing hard against her, purring. Her heart faltered, but the rhythm of the purrs soothed it, made it slip into a slower but still existing rhythm as she fell asleep. Crouched beside her, the cat opened its jaws and glittering motes flew out. 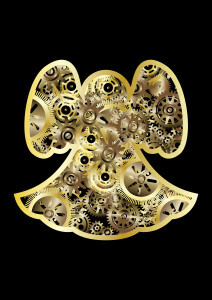 Anyone wearing Aurora’s spectacles might have seen them: tiny clockwork angels with shining spindles, setting to work. Bit by bit the angels spun, and the air became glass. First filling the room, suspending the sleeping Aurora, then spreading outward from the cellar, catching the mansion’s inhabitants till they were suspended as well, unmoving, but still in the attitudes of life in which they had been captured: the Lord and Lady holding hands as they walked in the garden among the partygoers, looking for their daughter; the cook putting the final layer of icing on the seven-layer cake intended to cap the evening; the butler tending the enormous furnace that heated the hot-water, even the flames, all caught in glass. Scientists came from all over to study the enormous lump of glass in the middle of the city. They tried drills of diamond and moon metal, and acids that would burn through almost anything, and certain frequencies of sound, but the glass stayed, obdurate and unyielding. Some set up camp in order to study the phenomenon; after a few decades an open-air university sprang up there, devoted to unlocking the science behind the glass’s appearance. In time, everyone forgot what lay inside the glass as its surface dulled and clouded with years. Till one day, a new scholar appeared at the University, which by now had been built so far that it completely encased the block of glass. He was a young man of modest garb and humble demeanor, but he brought with him a black leather satchel of the kind doctors often carry. When questioned, he indicated that he wished to study the glass at the University’s heart. The other students derided him. By now they had forgotten about the glass, since no study of it had ever yielded the slightest result, and it was regarded a fruitless and outmoded subject. But he persisted, and eventually they took him to the corridor that led to the glass enclosing the mansion’s front door. All he did there was open his satchel. Nothing came from it at all, but after it had been opened for a moment, he smiled and closed it again, before inviting them to go drinking with him. He and his fellows drank all through the night. And while they did, the tiny clockwork butterflies, too small for the eye to see, that had risen from his suitcase, clung to the glass and slowly ate away at it. In the morning, the students that had been drinking heard a great crash. The center of the University, an immense airy structure used to study the movements of the stars, had fallen in, lacking the glass upon which its slender struts had once rested. They rushed to the corridor and found the glass gone. Pressing inside, they found the building, the confused partygoers wandering about among the wreckage covering the garden, the Lord and Lady among them, dressed in antiquated clothes and speaking in accents that had not been heard in a century. Some pushed on, into the still intact mansion, and wandered its hallways in turn, until they came to a cellar door guarded by a clockwork cat. Inside, the new student sat watching the sleeping Aurora, patiently waiting for her to stir. Which of course she did. But that story must wait for another tick of the clock, when the angels dance again. If you enjoyed this piece and want to support the creation of others like it, please consider supporting me on Patreon, buying a book, or passing along word of my work. This entry was posted in free fiction and tagged clockwork angels, patreon, steampunk. Bookmark the permalink.